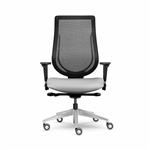 The Ray Highback Conference chair features a modern design with an innovative React mechanism that can self-adjust for its user’s most ideal sitting position. Excellent for both boardroom and meeting room environments. Also available in Midback. The You High Back chair provides a sleek design profile for any office environment. Also available in Mid Back. Requisite Highback Conference chair is a series of seating solutions that provide a highly durable all-steel construction that create and ideal solution for both conference and executive spaces.